Speedway Meadow – West Side of 19th Ave. Yesterday we started our summer of taking part in festivals as a part of our presidential campaign. A summer of being outdoors! 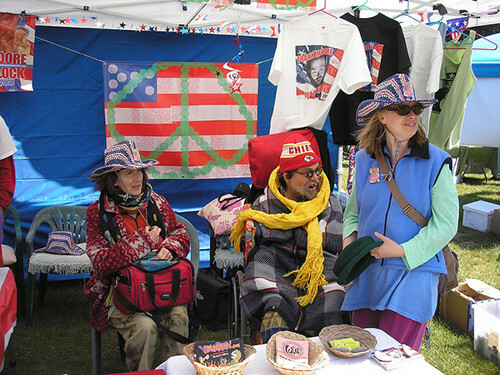 We had a booth at The Green Apple Festival, a multi-city celebration of Earth Day. The festival was in a really great area of Golden Gate Park and there were lots of people there, wow! We made a stop at the toilets and were happy to see that there were so many of them. We could see our booth from quite a distance away all decorated up with the banner and the decorations. Corey and Alexi had done a great job of setting it up and decorating. We all had our chairs to sit on with pillows. We settled in and had our beverages. And then it started, the steady stream of people coming up to the booth was constant for the next few hours. We all had on our Frank Moore for President red, white and blue cowboy hats. It was amazing watching everyone be drawn to our booth. If they did not come right up they just looked and looked at us and the banner just taking it in. We gave out lots of platforms and postcards and pins. Many people stood and read the platform. Some people had some questions for Frank. The kids were fun to watch as they took us in and asked things like "What Does he Got," "I got girls" Frank said back! Several people got worked up about the Kansas City Chiefs hat that Frank was wearing of all things! It was really fun to watch people's faces as they saw us and took us in, you could just watch changes happening within people, their minds expanding! They would just look and look and soaked us in, some then smiling with Joy, or saying is this for real? And then going through more changes when we say yes and you can write Frank in on election day. Many people seemed to know who Frank was or had seen us on TV or a past performance or we had been on their radio program. Frank asked one guy who sees us on TV what he thinks of our programs and he says wow, he never knows what is going on but we are usually naked and singing and he never sees anything like it on TV!! Lot's of people took photographs and some shot video of us and there were a couple of short interviews with Frank that were recorded. It was amazing! Amazing that so many people were drawn to the booth and so fun to watch how they would just look and look and soak us in and you could see changes happening with them. We wished we had our video camera with us so we could tape people's reactions! It was really fun! We looked around at some of the other booths briefly but decided not to do any shopping and towards the end we got some really yummy snacks before we hit the road, a pea soup and Caribbean wrap and some spirit water with mint and citrus in it and hibiscus tea. A really good snack. Soon it was over and we started braking down the booth and packing up. We loaded up the car and headed home talking about what a fun day it had been and this was only the beginning of all the festivals we would be doing all summer!!! So we drove down onto the field, unpacked the truck, drove the truck back and started setting up! It was a lot of fun, but boy did it seem to take a long time! We realized that last time we had Carl Bryant helping us, and the wind was a factor ... it took some trial and error (stacks of platforms making for the hills!) to figure out how to windproof the booth. But it was a lot of fun, and before we could even finish setting up, people were coming by wanting to find out about Frank, wanting to talk politics! We were finally finished, and sat down and had some trail mix, eyeing the food booths ... and finally you guys were close! Corey went up to meet you, and then reparked the truck, and the rest is history! It was amazing to hear the responses of people to Frank running, and the reactions on people's faces just looking at the whole set up, looking up at the banner, looking at us ... the kids looking at Frank ... every sort of reaction in the range from mind-twisted reality-jarring to pure appreciation. So neat that people donated for buttons, and that so many signed up to be electors, most of them knowing what that was about. And it was really neat to hear people say several times that they don't believe the "wasted vote" line ... like Richard said, that it was actually more of a waste of your vote to throw it to one of the major candidates when you don't really want them for a president, and there are others out there who you would feel better about, just to get the lesser of two evils, etc. It was fun that Frank reconnected with people from the past ... the radio show host, the guy who used to book the Chameleon ... a really amazing day all around. And we were saying when we got home that it was kind of sneaky the way that we are getting the Frank Moore for Pres. booth into all these festivals ... could the major candidates have people attend these things? Would they if they could? It would be a great opportunity for any candidate running for office ... and yet we were the only ones there at Green Apple! And like the Zona Verde guy said "they" (the organizers) had a problem with candidates being in the festival, but he was going to try to make it happen for Frank because, "this is great! this is wacky!"